Fill in the Search bar to find your cap. Click the facebook graphic to enter upcoming trivia contests for a free cap and interact/contribute to preserving baseball's past. One of only 3 game worn baseball caps ever worn by Babe Ruth that was salvaged for auction. This one went for $250,000. 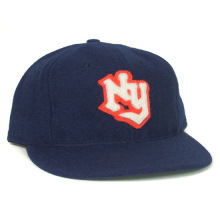 NY David Wells sold his 1932 cap for $432,000 at auction. See his story below > David Wells story. 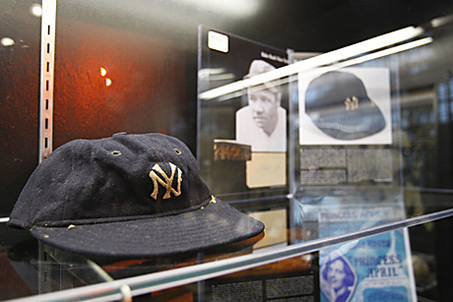 The bidding of a Babe Ruth worn baseball cap. 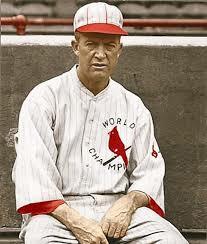 We have been an online business since 1995 selling baseball merchandise in a nostalgic atmosphere. We have NO licenses for ANY products but sell merchandise that have been licensed by other companies. We are just like any other type of storefront in the NEW age of business with different ideas to present our products with education. Our origins started with a dream to being back baseball history after the 1994 walkout. We were in hopes nostalgia would reignite that passion with our presentation. 250 team style selections to choose from American Needle. 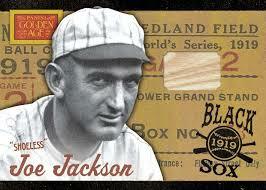 For visual effects, we have included a baseball card snapshot of players wearing replica's in their time periods. Ballcap Blog In the days before exclusive licensing, many different companies competed to make various parts of a ball players' uniform. 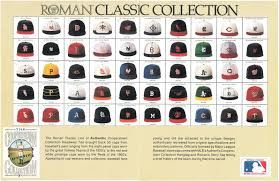 Many different Companies like Spalding made ballcaps before New Era was granted exclusive license for ballcaps in 1994. Click here for the Ballcap Blog.by Paul Carr Ebbets Field Caps 100% classic wool caps by Ebbets Field Flannel. International and Federal Leagues. at the Caps section. Short or standard visors as they were made on originals. from the Montreal Royals, Chicago Whales and Orioles 1939. 8 panelclassics Available Now- Replica 8-panel Cooperstown cap classics with leather sweatband -1944 Browns- 1934 Cards- 1919 White Sox The classic short bill from "Field of Dreams" Shoeless Joe Jackson of the White Sox with 2" bill. 1950-60's Yearbooks Vintage Baseball yearbooks are great collectibles as they provide a snapshot of a particular team, along with stories, pictures, and statistics 28 baseball yearbooks selections from 1950-1960's Statesman CAPS Click Pacific Coast League caps for these vintage caps with leather headband/adjustable sizes. Oakland Oaks, Seattle Rainers, Hollywood Stars, SF Seals and many others. 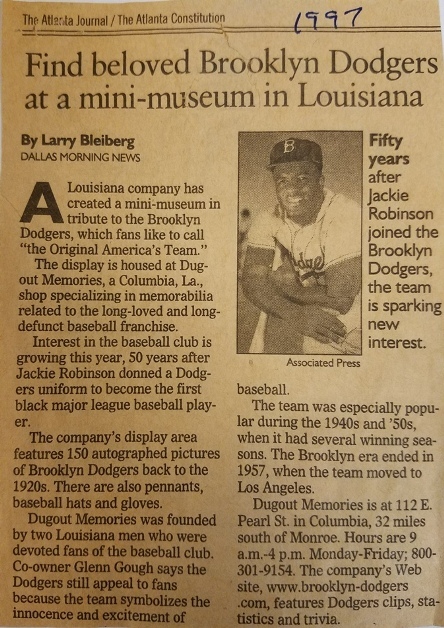 Atlanta Journal 1997 Our first brick and mortar store in a small town (pop 350) celebrating Jackie Robinson 50th anniversary. 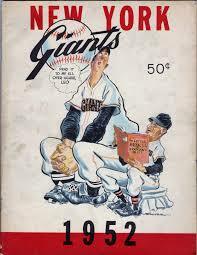 Vintage Posters View the Baseball Vintage Posters section for great wall presentations. ( Red Sox, Indians, Brooklyn, Yankees, Ebbets) ScoreboardClocks Miniature replicas of historic scoreboards. Clocks featured are Ebbets Field, Polo Grounds, Sportsmans Park, Crosley Field, Wrigley Field, Yankee Stadium. Baseball Reprint cards View the Baseball card reprint sets The first major set of baseball cards was issued beginning in 1886 by Goodwin. 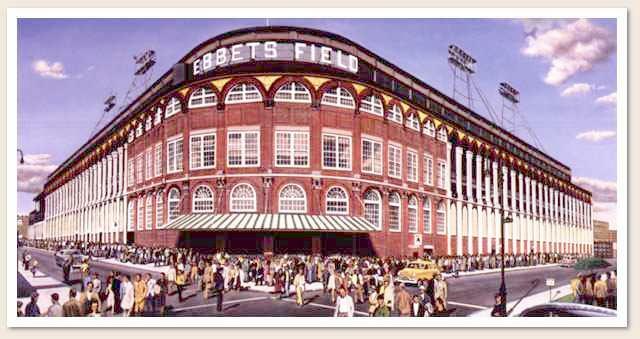 Featuring the Topps Brooklyn Dodgers archive set of 165 cards. 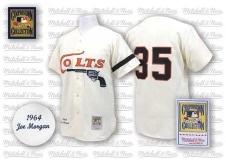 1962 Colt 45's Mitchell & Ness is slowly reducing their allocation of wool flannels. Jackie Robinson School Project Helpers The day the color line was crossed. Jackie Robinson scores after homering in his debut with the Montreal Royals at Roosevelt Stadium, Jersey City, on April 18, 1946.. You can view other school project material and links from this wonderful and informative site for Brooklyn Dodgers history since 1899 through 1955 era - Jackie Robinson research page/photos at Brooklyn Dodgers - Jackie Robinson school project and resource helpers page..